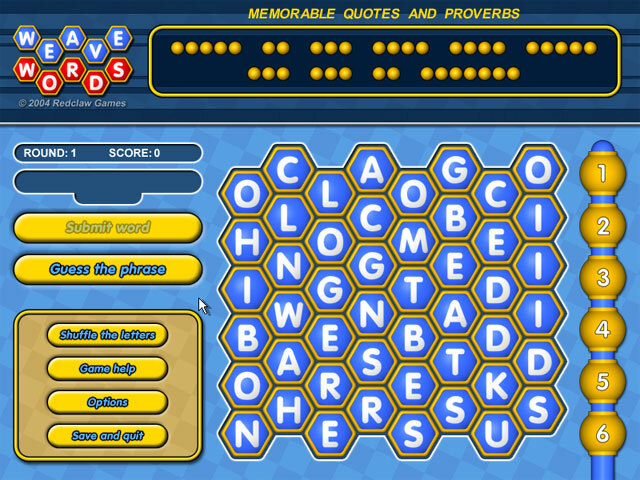 Weave Words is also very customizable and expandable, and comes with an easy to use phrase pack creator, allowing you to create and share puzzles based on whatever subjects you desire. - Thousands of phrases to play, with more to download for free. - Relaxing, interesting, and mentally stimulating gameplay. - No time limits or pressure, just play at your own speed. - Customize the game to your liking by choosing which subjects you enjoy. - Create and share phrases with other players with the phrase pack tool. Qweas is providing links to Weave Words 1.5 as a courtesy, and makes no representations regarding Weave Words or any other applications or any information related thereto. Any questions, complaints or claims regarding this application Weave Words 1.5 must be directed to the appropriate software vendor. You may click the publisher link of Weave Words on the top of this page to get more details about the vendor.